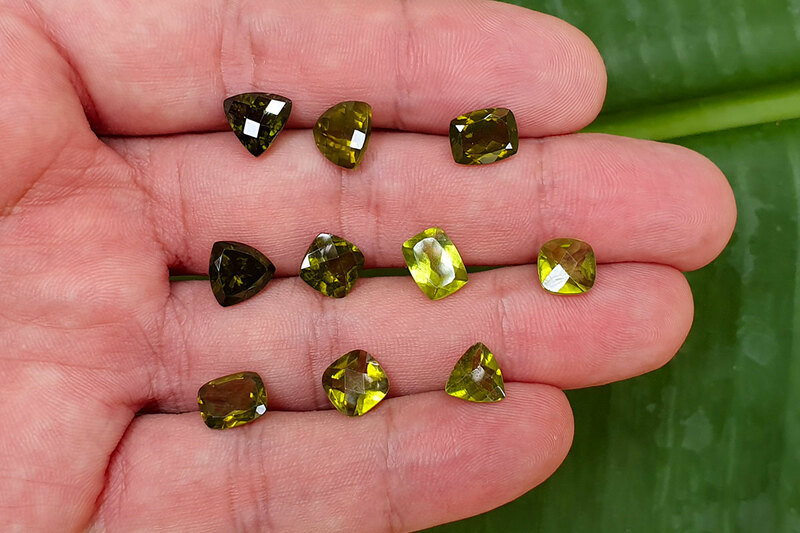 Vesuvianite, also known as idocrase, is a green, brown, yellow, or blue silicate mineral. Vesuvianite occurs as tetragonal crystals in skarn deposits and limestones that have been subjected to contact metamorphism. It was first discovered within included blocks or adjacent to lavas on Mount Vesuvius, hence its name. Attractive-looking crystals are sometimes cut as gemstones. Localities which have yielded fine crystallized specimens include Mount Vesuvius and the Ala Valley near Turin, Piedmont. The specific gravity is 3.4 and the hardness ​6 1⁄2. The name “vesuvianite” was given by A. G. Werner in 1795, because fine crystals of the mineral are found at Vesuvius, these are brown in color and occur in the ejected limestone blocks of Monte Somma. Several other names were applied to this species, one of which, “idocrase” by R. J. Haiiy (1796), is now in common use. A sky bluish variety known as cyprine has been reported from Franklin, New Jersey, USA and other locations. The blue is due to impurities of copper in a complex calcium aluminum sorosilicate. Californite is a name sometimes used for jade-like vesuvianite, also known as California jade, American jade or Vesuvianite jade. Xanthite is a manganese rich variety. Wiluite is an optically positive variety from Wilui, Siberia. Idocrase is an older synonym sometimes used for gemstone-quality vesuvianite. The fibrous copper-bearing variety cyprine was first observed by the author in 1905 in a small dump of unknown origin at the mouth of the Parker shaft. It was in bundles of slightly radiate needles scattered through a coarse-grained feldspathic pegmatite. It is abundant in the specimens and is conspicuous, as its color is blue to blue-green. With it are manganophyllite, yellowish garnet, and native copper in threads and irregular fragments. As the mineral was not at first recognized as cyprine but was thought to be a new species, material for analysis was separated by crushing and handpicking and careful rejection of all traces of the associated metallic, copper, as the mineral itself contains copper in combination. Analysis 1 is similar to that of cyprine from Tellemarken, Norway, but differs from it in details.